PS4 Component is available now in the 0.89 release. This is based off of the node.js package PS4-Waker and the Python module pyps4. The dependency for this component is a modified fork of pyps4. This component is structured very differently than the custom components posted on here. No dealing with ps4-waker, more reliable art-work fetching, no configuration.yaml, no constant exceptions (hopefully). Please read the docs linked below before starting. For more info see docs. I’ll have a look tonight! This looks great! I hope it will be in a stable release soon. I wish I could test it, but I’m running HassOS. In a text editor, open homeassistant/config_entries.py in your source directory and add the line 'ps4', in quotes in the FLOWS list defined at Line 137. Reference here . Don’t copy this file as it might break your instance, just add the line. yea, I can’t find it either. Im not sure we can using a docker. Hi. Have you managed to make it work? @Ktnrg45 i have added all files and change the config_entries.py, the PlayStation 4 integration is available in dashboard but when i click it, only what i see is “color” circle spinning. I have HA in docker (Synology NAS). I tried this component on HA 0.88b0 and it works great (I didn’t change the media_player.py file name to ps4.py). I just get the grey box with spinning circle when clicking configure. @Bartem this is sth similar to my error. Sorry about the wait. The PR is approved. So should be releasing soon. For those who were experiencing errors it was because there was changes requested to the library. Your NAS may be using ports 987 and/or 997. The component requires these 2 ports. You can try rebooting your NAS and check again. I tried updating with your changes… maybe I messed something else… but I was able to connect a pair second screen… but now get this. 2019-02-15 21:19:06 ERROR (MainThread) [homeassistant.setup] Unable to prepare setup for platform media_player.ps4: Platform not found. Hey @ktnrg45, this appears to be working fine (I’m on 0.89.0b1), however the only thing that doesn’t quite seem to be working is turning the PS4 back on from rest mode. The card in HA shows the state as Unknown, and clicking start doesn’t seem to do anything. If I turn on the PS4 manually, everything else with the component works as expected. @Hansel Hmm, can you turn on PS4 normally from the 2nd Screen App? Theres a setting on the PS4 that you have to enable to be able to turn on from standby. Hi @Ktnrg45, I’ve commented on the github issue, but I’ll double check this when I get home. Maybe it just set up funny initially? Is it easy enough to forget the current config and redo the integration? Yes you can remove and redo integrations. This is/was an issue at my end. Basically my PS4 loses network connection when its in rest mode. I’ve switched it to a dynamic IP and weirdly that appears to have fixed it for now. This has been the component I’ve been looking forward to the most. Thank you for putting in the time and effort into creating this for us to use. Netstat shows I don’t have anything bound to port 987. 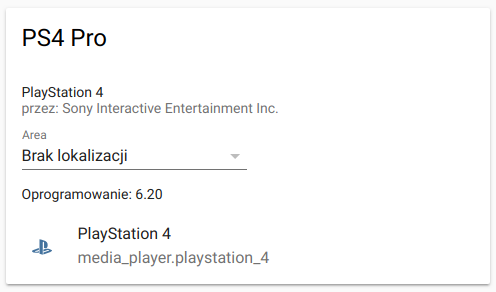 PS4 is online and in the same subnet as the homeassistant instance. Further info: running in python 3.7.2 venv located at /srv/homeassistant on Debian Buster. HomeAssistant is fronted by Nginx.